Australia’s Lucapa Diamond Company Limited, Angola’s national diamond mining company and private local partners Rosas & Pétalas have announced the sale of the 404.2 carat diamond that was recently discovered at the Lulo Diamond Project in Angola’s Lund Norte province. Lucapa said in an ASX release that the Lulo alluvial diamond sold for A$22.5 million, which represents an average price of A55, 585 per carat – a record price for a white diamond recovered from Lulo. 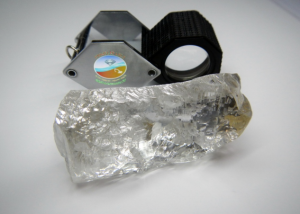 The company’s Chief Executive Stephen Wetherall said Lucapa and its partners were thrilled to have achieved a record sale price for the biggest recorded diamond ever found in Angola. “The sale of a single diamond for US$16 million underlines the huge potential of the Lulo diamond field to regularly produce gems which are both large and of world-class quality,” Mr Wetherall said. Lucapa, which operates the Lulo project, has a 40% interest in the alluvial mining operations, with Endiama holding a 32% interest and private Angolan partners Rosas & Pétalas holding the remaining 28%. Mining operations at Lulo began in 2015 following the awarding of a mining licence in November 2014.